Despite strong revenue growth, L Brands stock tanked after the company's recent earnings release. Here’s why the bears are right. Despite owning the leading premium brand in its industry, Victoria's Secret parent company L Brands (NYSE:LB) is having a very challenging year. Shares of the company, which also owns Bath & Body Works and the PINK apparel brand, are down a stunning 52% on the year. 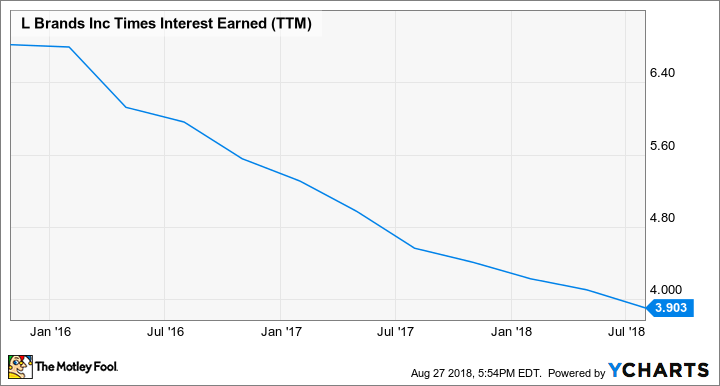 That decline has pushed its dividend yield up above 9% and its price-to-earnings ratio down to 8.8 times earnings. 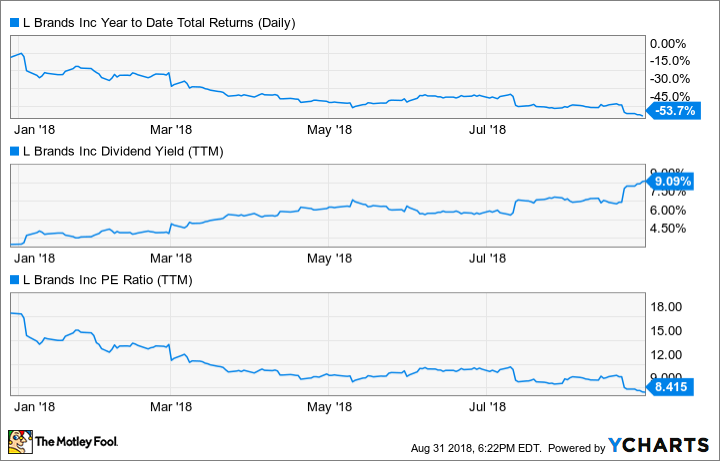 L Brands Total Return, Dividend Yield, and P/E Ratio: data by YCharts. Those kinds of metrics portend a rapid deterioration, but also might bring out value investors, who often look at beaten-down stocks poised for a turnaround. At first glance, it may seem like L Brands is doing OK. Last quarter, revenue climbed 8.3%, which doesn't exactly make the company seem like a deteriorating business. However, a closer look at its financials reveals those growth numbers aren't nearly as beautiful as they appear. L Brands' fiscal 2018 revenue is benefiting from a recent accounting change having to do with the company's private-label credit card, which it distributes through a partnership with Alliance Data Systems. Is L Brands' dividend in danger? Image source: Getty Images. Previously, L Brands recorded the revenue it received from the Victoria's Secret credit card as a reduction in selling, general, and administrative (SG&A) costs. Under new accounting rules, though, the company now counts card revenue in its top line. This change increases reported SG&A expenses in tandem. As you can see, last quarter's top-line growth was overwhelmed by a rise in expenses, especially SG&A. Data source: L Brands Q2 press release. Table by author. YoY = year over year. Rising costs on both the costs of goods sold and SG&A lines led to a nasty 24.2% reduction in operating profit. Not only did SG&A expenses explode higher, but gross margin also fell, likely indicating that the company is heavily discounting to clear inventory: not good for a premium brand. Unsurprisingly, L Brands lowered its full-year earnings per share guidance to $2.45-$2.70, down from the prior range of $2.70-$3.00. What's even worse is that L Brands had already lowered its EPS guidance just three months ago from an initial range of $2.95-$3.25. Two successive guide-downs mean management seems to have lost its sense of demand and industry dynamics. That's (understandably) sending investors into a panic. A company that is struggling in its core business could be in double jeopardy if its balance sheet is in question. Unfortunately, that also seems to be the case here. Despite a profit crunch and stagnating sales, L Brands' inventory was up both year over year and quarter over quarter at the end of last quarter. That could mean L Brands has produced too much inventory, which could lead to even larger clearance sales in the future. L Brands TTM Interest Coverage Ratio, data by YCharts. TTM = trailing 12 months. While L Brands' 9%-plus dividend yield and low P/E ratio are tempting, I wouldn't touch the stock right now. It has all of the elements of a value trap. Unless the business can turn around in short order, it's quite possible the company will have to cut its dividend in the near future. That would probably be the right move, but it will likely disappoint current investors and cause another big sell-off. While it's possible L Brands has hit bottom, it's very hard to tell. Retail is tricky, as it's hard to know which products will resonate with customers and which ones will fizzle out. With a declining business and high debt load, L Brands stock has the potential to trade even lower. I'd steer clear.